Have you heard about leafcutter bees? They cut pieces of leaves to line their nests. I used to see holes missing from my rose leaves all the time when I lived up north but never knew exactly what was causing the damage. I just happened across a 3 line note in a newspaper recently and was intrigued. leafcutters don't eat the pieces of leaves they cut but carry them back to their next to use as nest cells. Each cell is then provided with a mixture of nectar and pollen. The female lays an egg and seals each cell creating a nest tunnel. Each tunnel can contain a dozen or more cells forming a tube up to 8 inches in length. The bee babies will develop in the cells and emerge in the next season. they are considered important pollinators of wildflowers, fruits and vegetables, and are common in the US. 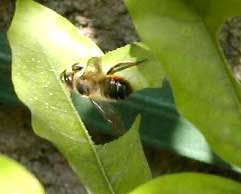 my favorite fact - leafcutter bees are not aggressive toward people and will only sting if handled. Bees are fascinating creatures, aren't they? Happy Gardening and special thanks to Rick at Order of the Bath for the picture.